You will LOVE the silky smooth, light consistency and buttery flavor of this Swiss Meringue Buttercream frosting recipe. For most of the cake decorating tutorials and recipes on my site, I use American Buttercream frosting (for example, Classic Vanilla Buttercream). American Buttercream recipes are very easy to make, using simple combination of butter, confectioner’s sugar, milk, and flavorings. These are often crusting buttercream recipes that are slightly denser, sweet, and are perfect for piping. The first time I tried Swiss Meringue Buttercream frosting, I fell in love with the ultra smooth, melt-in-your-mouth quality of this frosting. It is less sweet than American Buttercream, and has a fantastic flavor. This is not a crusting recipe, and so the Viva Paper Towel Method of smoothing will not work for this frosting, but it does pipe nicely and can be used beneath fondant (when chilled). If you’ve never tried Swiss Meringue Frosting, you MUST give it a try at least once! The process takes a bit longer but the resulting frosting is heavenly! It may just become your new favorite! Place the egg whites, cream of tartar, and sugar in a heat proof bowl (I use my kitchen aid mixing bowl). Put this over a pot of simmering water, whisking by hand until a candy thermometer attached to the side of the bowl registers 140 degrees. Transfer this to your mixer and put in the whisk attachment. Whip on medium high speed until it reaches stiff peak stage This could take about 10 min. The bottom of the bowl will cool off . The mixture will become fluffy and glossy. While the meringue is beating, cut the butter into tbsp sized pieces. When the meringue is ready, put the paddle attachment on the mixer and add the butter a few pieces at a time while beating on low speed. The mixture may look like it is separating after you add the butter. Don’t worry, just continue beating on medium-high speed and it will become smooth again. *Make sure to check out our full listing of tried and true recipes for our favorite Cakes, Cupcakes, Fillings, and Frostings in our Recipes Section! Hi Lenylia– No, it doesn’t. We have a video tutorial on making this recipe and frosting a cake with it if you would like to get a better idea of what it is like to work with. Hi! I was wondering if I could add cream cheese to this after its all done or will that effect the texture? Hi Jennifer–I’ve never tried doing this but I found a recipe/blog that looks good for adding (whipped) cream cheese to swiss meringue buttercream- If you try it, let us know what you think! Hi, I was wondering if I can leave out the cream of tartar? Thanks! Melissa, I made this today and it was so soft and almost liquidy. I am so sad. I let it mix on my stand mixer for 45 min to cool down and put my butter in very slowly and then still let it mix for another 20 min and it was still so soft. Its in my fridge right now in hopes that I can salvage it. Any advice for the future? What did I do wrong? What are your recommendations for the “ruined” SMBC? Would you be able to make SMB ‘softer’? Would putting more egg whites making the buttercream softer? not as firm? I know that if SMB is cold they are firm and become softer at room temperature. Someone would like this icing to be softer.. so I am just wondering if that is possible. Can this recipe be doubled or does it need to be made batch by batch? Hi, the temperature that is mentioned is in Fahrenheit? Hi Antonina, Yes, the temperature is measured in Fahrenheit. Hello ladies, yesterday I delivered a 3 tier fondant cake using this icing. It is delicious! However, I had trouble sleeping because I as thing that the icing was too soft for fondnt. I watched the video and when you finished making it, you mentioned it was ready to use or if not it could go in the fridg. So I immediately used it. I’m thinking that it was just too soft under fondant and would just soak in the cake like whipped cream. I pray it was fine. ?? But did I miss something in the video, or would it do you think it was ok? I’m thinking maybe in my haste, I overlooked an important detail because you ladies are always very thorough with instructions so I know I missed something! Just wish I didn’t think about it after the fact. I really thought this would be my go to frosting, but if it just absorbs in the cake…I gotta go back to American buttercream…I had no problem making it…just the exectution as far as under fondant. I was hoping your video showed it under the fondant…please clear my brain and tell me what I did wrong. Do you have to put extra extra frosting under the layers? I really think I screwed that cake up. Please Thanks in advance!!! I know it’s after the fact but maybe i will do another cake. I fill like tetiring my apron! ?‍♀️? ?Again thanks so much!! Hi Terri Tate, I am sorry this has caused you worry. Yes, Swiss Meringue Buttercream is used under fondant. As when using American buttercream it is good to chill your frosted cake before laying on the fondant? Chilling makes it easier to lay on the fondant. Even if you did not and your caked looked good when completed (and it sounds like it did) there will be no problem for your customer. As for your question on putting extra frosting, you may need to do that when trying to create a completely smooth surface. Just put your cake tier in the freezer or refrigerator for a quick chill after being frosted. It is chilled when you can touch it but it does not leave a fingerprint. Take out of the refrigerator and smooth with your bench scraper to get a smooth look. You can repeat that process is needed to get the frosting as smooth as you would like. When you have it smoothed you can put it back in the freezer while you roll out your fondant. 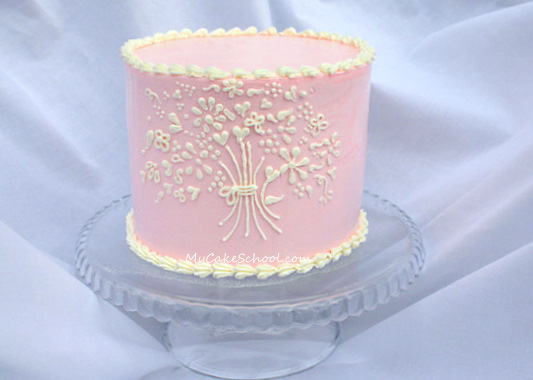 You may need to lightly brush the cake with water or a simple syrup to help the fondant stick to the frosted cake. Hope this is clear, let us know if you have other questions. Hello ladies, the cake came out fine but I️ now know to tefeigerate prior laying down my fondant. But is it possible to mix Swiss buttercream with your fluffy buttercream? I️ absolutely love the taste of the Swiss but love the crusting of the fluffy bc. Just wondering if you ever tried it before I️ try…thanks in advance! Hi Anita, The recipe will make 4 to 4 1/2 cups. It will cover a 2 layer 8 or 9 inch cake with a simple frosting. To fill and frost with decorative piping you will want to make 1 and 1/2 the recipe or double the recipe. I have never tried swiss buttercream. So there is no powdered sugar? Hi Peggy, I’ve seen a recipe or two that does call for powdered sugar, but most do not.